Today's experiment is a 10 MHz low pass filter to clean up a square wave and turn it into a sine wave. This comes from the realization that the reference output from my Racal Dana 1992 universal counter is very unclean square wave instead of a pure sine wave. Because square waves are actually composed of numerous harmonically-related sine waves, a good filter can extract just the fundamental tone of interest. Cool, huh? Why is this important? Let's delve in a bit further . . . 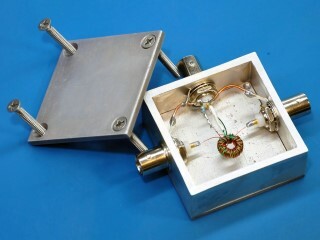 This is a refinement to an earlier 40 dB coupler that I built in 2013. That first one was taken directly from the May/June 2013 issue of QEX Magazine. Inside, there was an article from Loftur Jonasson (TF3LJ / VE2LJX) about building a simple digital RF power meter. Jonasson's article referenced and built on earlier work by W7ZOI and W7PUA (published in the June 2001 issue of QST). This is a little experiment at building a circuit that seems easy, but may not actually be that simple. I needed 0° power splitter for my 10 MHz precision frequency standard project. I picked up a Minicircuits ZFSC-2-1 on eBay which solved my immediate need, but the allure of experimentation is too strong to resist!